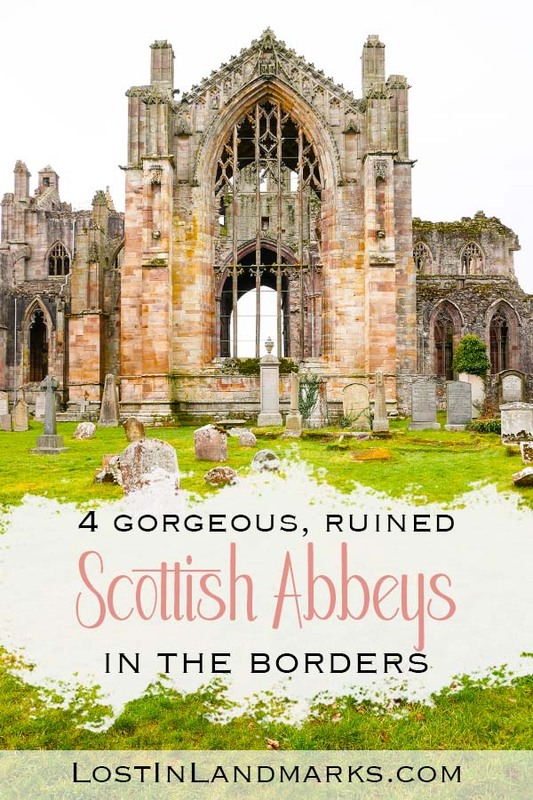 Scotland’s Borders Abbeys are some of the most picturesque ruins I’ve been to and if you’re looking for something to do and see while travelling in Southern Scotland then I highly recommend a trip! They provided perfect days out for us since we were travelling for the first time with our new dog, Annie, and they all allow dogs on a lead. There are four main abbeys in the lowlands of Scotland and they are all really close together – Melrose, Dryburgh, Jedburgh and Kelso. If you wanted you could probably fit a visit to all 4 in one day but we spread them out over a couple of days as we were travelling in the winter and the days were short. Plus, we don’t like to get up too early! Head to end of the post for information on getting to the Abbeys from Glasgow and Edinburgh if you’re based there – it’s fairly easy! 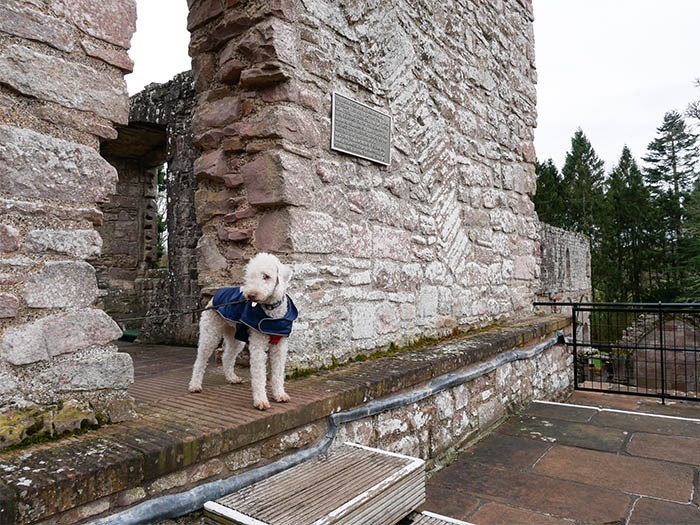 Our dog Annie enjoying exploring at Dryburgh Abbey! It’s no coincidence that the abbeys in the Scottish Borders are so close together. Building them showed power over the border lands which were often contested. David I, who was later to become King of Scotland was really putting on a show of power here. All four abbeys have different orders of monks who lived there, but they all shared a similar fate. 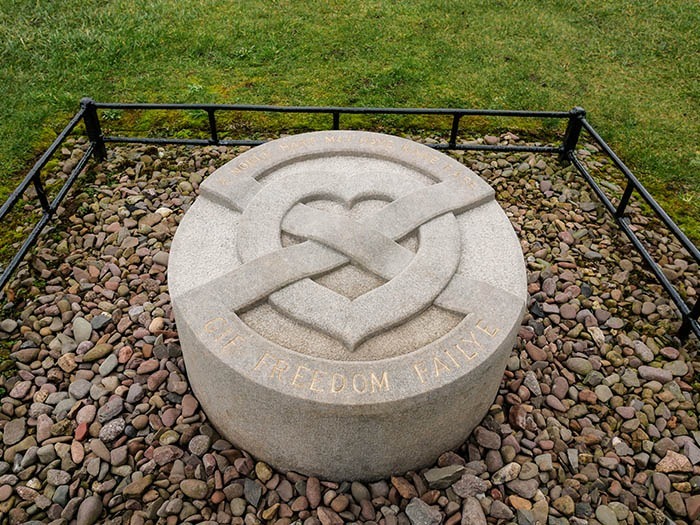 They were often attacked during the Scottish Wars of Independence in the 1300s, attacked by the English on many occasions, including in the 1500s in what was known as the Rough Wooing – a time when Henry VIII had distanced himself from Rome and wanted to break the alliance they had with Scotland. They were the victims of all the political and religious swings and their fate was mostly sealed with the bringing of the reformation and the banning of celebrating mass. All are now in a ruined state, although some have been preserved in better ways than others. Some have much more of the building present, some more of the interiors but all of them are a stunning reminder of the medieval history of the land. 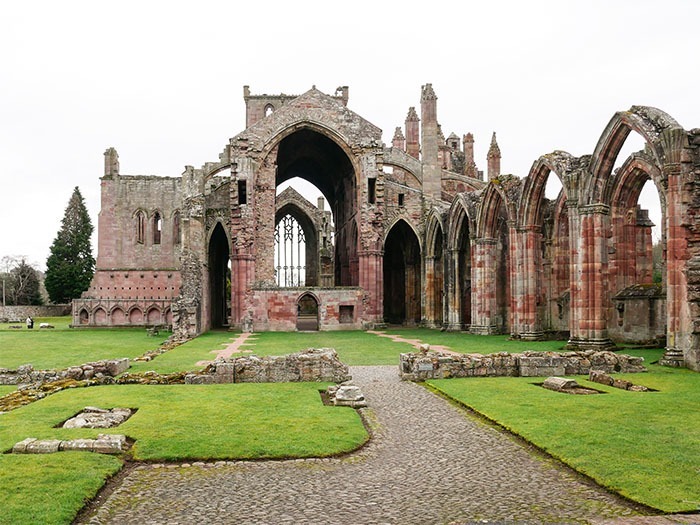 Founded in 1136, Melrose Abbey is the work of Cistercian monks and it was ordered to be built by David I. The new abbey was not built on the same site, but a few miles away due to the need for better faming land. The monks came from Riveaulx in Yorkshire (where there’s also a gorgeous ruined Abbey if you’re ever in the area). Monastic life lasted here for over 400 years and saw many changes in the country from the fighting with English Kings, Edward I and II to an attack in 1385 by Richard II. The latter caused much damage and most of what remains of the Abbey is from teh rebuild after this. The last monk here died in 1590 and the Abbey was left to ruin after that. Melrose is a stunning Abbey and it was built of a gorgeous red coloured stone which gives it a slightly different feel to the other Abbeys. There’s much to see there with plenty of carvings and stoen scupltures still present on the Abbey – my favourite was definitely the bag pipe playing pig! Melrose Abbey is alaso said to be the resting place of Robert The Bruce’s heart (although his body was interred at Dunfermline Abbey). Excavations at the site found a lead casket that would have been used to bury a heart, but the placing of the burial wasn’t consistent with where we’d really imagine a king would have been buried. It was found in the Chapter house rather than near the High Altar which would be what is expected. However, it’s widely reported that his heart is buried there and the site that it was found is shown with a small marker. Melrose is a nice little town to visit too which plenty of small shops to peruse, including a lovely little sweet shop just near the Abbey entrance. They do amazing scottish sweets like tablet there! There’s also plenty of walking around with the looming Eildon hills ever present and it’s part of the Borders Abbey trail and also the St Cuthberts long distance path too. A small distance from Melrose is Dryburgh Abbey. The settlement of Dryburgh is no longer around so it feels like this abbey is in the middle of nowhere! It’s quiet and contemplative and just what you might imagine a place for a monk would be like. It was built only a little after Melrose, in 1150, but by a different order of monks. These were Premonstratensian and came from Alnwick in Northumberland. 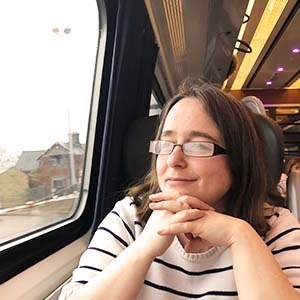 It shares many of the trials that Melrose did also, being attacked and destroyed in the 1300s, but Drybrugh didn’t get the same treatment afterward. The financial situation of Dryburgh always seemed to be lesser than Melrose and the other abbeys. It’s benefactor, Hugh de Morvilel the Constable of Scotland, couldn’t compete with a monarch! Also, later when the abbey was damaged by battles, Robert the Bruce wasn’t generous with Dryburgh and didn’t offer any money for rebuilding it. The reformation in 1560 essentially ended monastic life there. 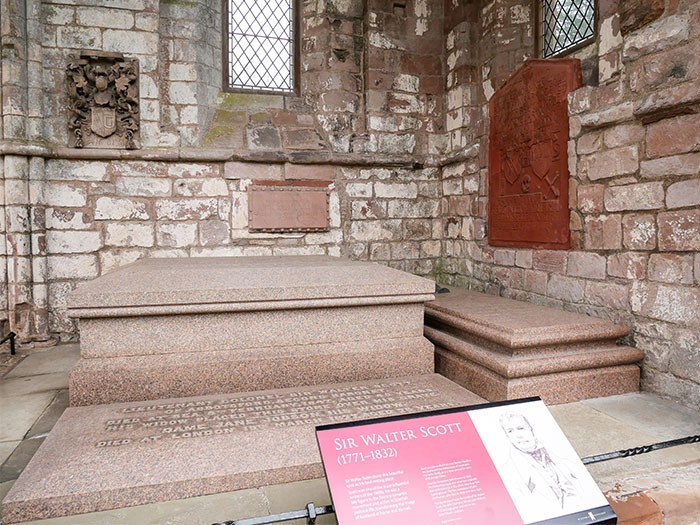 The ruins of Dryburgh attracted many people there in the centuries that followed, the most famous being the writer Sir Walter Scott. He loved it so much there that he was buried there and you can see his grave to this day. The feeling at Dryburgh Abbey is so much more different to the others that it really won over our hearts and we all thought that this was one of our favourite abbeys to visit. There’s lots to learn about here with plenty of information boards and also some areas where they have collected some of the stonework from the site to see too. 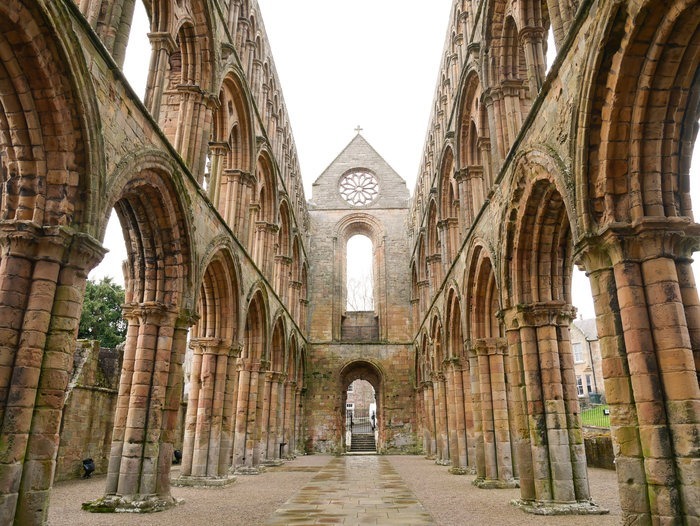 The most southerly of the border abbeys is the one at Jedburgh, an important Scotland Border town. It was founded by David I in 1138 and housed brethren from the Augustinian order. The Augustinians were influential with royalty and were also housed at the Abbey at Holyrood in Edinburgh. Jedburgh Abbey was subject to many conflicts over the years, like the others, and suffered greatly as a result. The remaining ruins are still very impressive here and the main church is still largely intact while some of the other areas clearly show the foundations and you can get a sense of how big the original building was. Jedburgh Abbey has many information boards as you go round to learn about life in a monastery, but also it has a small visitors centre with some artefacts found there and a model of how the Abbey would have looked in its heyday. Jedburgh is a really nice town to explore and spend a morning or an afternoon and if you’re driving to Scotland from the south or doing the reverse journey it’s a really easy place to stop off as it’s on the main A68 road with plenty of free parking. There’s a huge amount of history in the town including Jedburgh castle jail and also Mary Queen of Scots house. Blog post is coming soon on what to do in Jedburgh! Finally we have Kelso Abbey which feels ever so slightly less important than the other abbeys – possibly because not much of this site is remaining. Infect, at it’s height it was one of the largest, wealthiest and most important abbeys in the area. 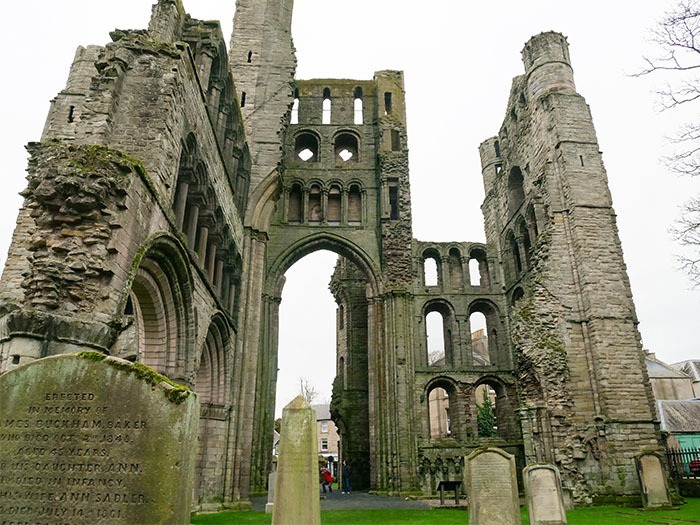 It was founded in 1113 by Tironensian Monks who were invited to the area by David I and suffered the same fates that the others did – fighting in the Wars of Independence in the 1300s, raids in the 1500s by Henry VIII and finally the reformation signalled the end of the use of the abbey. It’s sad to think of how much has been cleared away of this abbey, which happened in the 1880s, and when comparing it to the other monastic ruins in Scotland you can hardly believe that it was such a huge deal. Only the west tower remains of the abbey which is a poignant reminder of what might have been. Kelso is a really pleasant Border town to explore, and the abbey is only a coupel of minutes walk to the shops. There’s lots in the surrounding area to discover too, including Floors Castle which is an immense building! This is the only abbey that doesn’t have an entrance fee so it’s free to wander around in opening hours. All the abbeys are run by Historic Scotland and all but Kelso Abbey require tickets for entry. You can get tickets online here that cover all the historic scotland sites over a set period of time. This is what we did which enabled us to add in some visits to castles in the area too – it also covers Edinburgh and Stirling castle! You can also pay on the day at each site and each abbey has it’s own gift shop with the exception of Kelso. One of the attractions of the Scottish Borders is the amazing countryside that is around for you to enjoy. If you like the idea of walking in Scotland, perhaps the long distance trail that takes in all four abbeys might be worth considering. The Borders Abbeys Walk can be begun in any of the towns of Kelso, Jedburgh, Melrose, Selkirk or Hawick and is 64.5 miles in length (103km). To get more information about this walk please take a look here. Edinburgh is the nearest city to the Border Abbeys and is only around 38 miles away from the most northern town Melrose. Glasgow is around 80 – 90 miles away and a much longer drive on country roads. The drive is easy and the roads, although sometimes winding if you go the scenic route, are good. All the abbeys have parking nearby – Melrose was the only place that charged for parking in the town but it was really reasonable and only about £1 for a couple of hours. If you’re looking for car rental options then I recommend checking out RentalCars.com as it compares prices from many different services. Buses are the best way to get to and around the Scottish Borders if you don’t have a car. I used the local buses to get to Edinburgh from St Boswells (the town nearest to Dryburgh Abbey) and it took around an hour and a half and was really reasonably priced at £4.50 for the single journey using their app (correct as at February 2019). You can see more information about the buses at their website here. Trains aren’t widespread in the area but you can get to Tweedbank or Galashiels which is near Melrose and take buses from there on. It takes around 55 minutes to Tweedbank from Edinburgh or just over 2 hours from Glasgow – see here for more details. If you’re interested in exploring at least one abbey (normally Melrose), don’t want to navigate the area yourself and would like to add in some extra bonus trips to other sites, then a tour group might be worth considering. I haven’t done these trips personally but the Get Your Guide site has many such trips. Best thing is that they are reviewed so you know whether others rate them or not. If you’re wondering where to base yourself when visiting the abbeys then it’s really entirely up to you. I have a bit of a soft spot for the town of Melrose after spending numerous weeks there on holiday in the past, but any of the big towns are good. 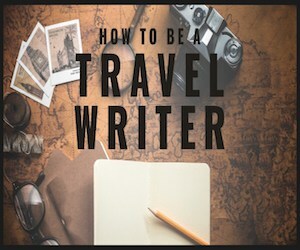 It will probably also be dependent on whether you’re planning to visit them all, just one or two and whether you have your own transport. When we stayed in the Scottish Borders we hired a cottage for a week through Sykes Cottages – it’s a great idea to give yourself a base that you can see the whole area from. If, like us, you’re travelling with a dog, you can often find pet friendly accommodation too! We thoroughly enjoyed the cottage and would definitely recommend it if you’re a family or like to have a self catering option. If you’re looking for a hotel here’s a recommendation for each of the towns near the abbeys for you to jump start your accommodation search from. In the centre of town is the Royal Hotel which is a historic coaching inn and would be a great base to enjoy a trip round the abbeys! Directly in the centre of Kelso and walking distance to the Abbey is the Cross Keys Hotel which comes highly recommended. 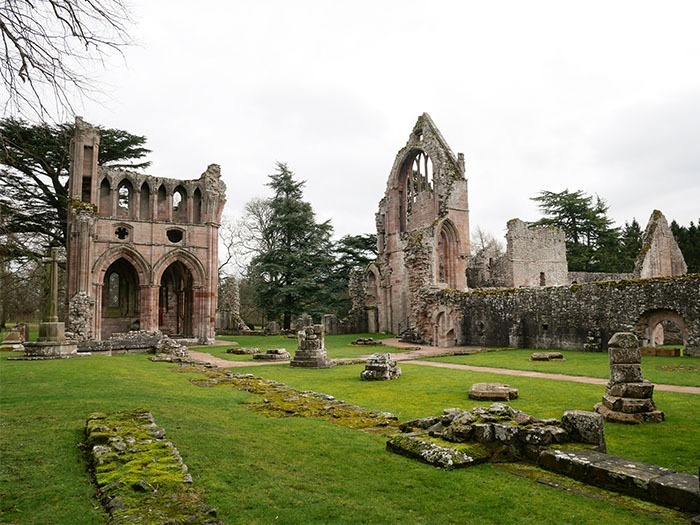 Dryburgh Abbey is much more remote than the other three but there is actually a hotel right next door which means you can enjoy amazing views of the Abbey or of the countryside from the comfort of your room! You can see more about Dryburgh Abbey hotel here.